Not even zaatar gurus can spot a fake that easily. Although it pains me to say it, I might have to think twice about buying zaatar items at the next Middle Eastern bakery I pass: It could be the case that there are harmful additives in the spice mixture. Zaatar, the unique combination of such spices as thyme, sumac, oregano, and sesame, among others, is seen in bakeries and in home kitchens across the Middle East. Food connoisseurs like Green Prophet’s own Miriam Kresh probably don’t hesitate to make homemade zaatar, but for the rest of us, it’s as simple as stopping in our favorite bakeries for a quick purchase. 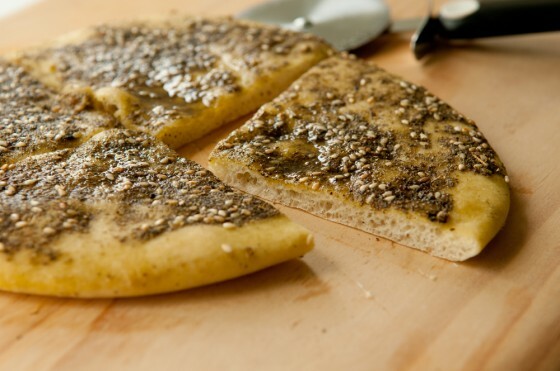 Flatbread with zaatar, or manakeesh bil zaatar, is filling and relatively healthy. In Lebanon, especially, it ranks among the top first meals of the day. I clearly remember eating it for brunch (or for breakfast, if you may, on those few occasions when I was up and about early enough) when I vacationed in the country. Manakeesh can be made with meat or cheese, instead of zaatar. In fact, the non-vegan options came first. Where health is concerned, the spice mixture would be the best choice of the three, as it is not known to pose any threats. However, the phony variety of zaatar is basically a thyme mix that contains less of the essential herbs and more chemical additives, which could potentially cause food poisoning and other bacterial infections. Last year, Saudi Arabia turned away a shipment of zaatar from Lebanon, after lab tests proved that less than half the zaatar was made of real herbs. Mohammad Halbawi, owner of Beirut’s Halbawi Grindery, shared his insider’s scoop that some grinderies mix the thyme with what they call “wheat derivatives,” but which are actually “shavings of spoiled kaak…crusty bread,” or even rely on a mix that is almost exclusively bran and whose green dye contributes a so-called herbal smell and appearance. Additionally, there are rumors circulating about wood shavings in the artificial zaatar. The tricky part about this scandal is the surprising indistinguishability between fake and real zaatar. “Not even a zaatar guru can distinguish the taste,” said Halbawi. Bakery owners who know of the fake zaatar but who have yet to make the switch are thinking of their loyal customers. The revelation of spoiled zaatar could mean a spoiled reputation. If they are so inclined, consumers are able to reveal the truth for themselves. It is a little-known fact that, when added to a glass of water, real contents of zaatar will sink to the bottom, in time, while unwanted additives should float. A change to the color of the water likely means that the mix contained a dye. It is no longer such a mystery why manakeesh bil zaatar prices have such a wide range in Lebanon, from LL500 to LL 3,500. It follows that the higher the prevalence of unwanted additives in any given bakery’s zataar, the higher the price. Government officials say they are willing to fight for change, for a return to the good old days of real zataar, but the citizenry must be the catalyst. Consumers are encouraged to file complaints if they detect any funny business – which, as we have learned, is hard to do, even for zaatar gurus – but with the water test, science comes up with an answer for you. Only after the people make known their unrest will further investigations be launched.